Join us for the Engineers as Educators Workshop (PDF) in the afternoon session! For more information: ATS General Chair Justine Wiles, vicechair-tech2015@aiaahouston.org. A-2.3 Reducing Edney Type-IV Shock-On-Lip Heating Via Leading Edge Shape Optimization by Patrick E. Rodi, PhD. B-2.3 Feasibility of Transferring On-Orbit Components of the International Space Station for Solar System Exploration by Shen Ge and Yvonne Vigue-Rodi. A former AIAA Houston Section Horizons Editor remembered a 2011 lunch-and-learn presentation on a similar subject. Below are links to the one-page newsletter article and the one-page PDF publicity flyer. Horizons one-page newsletter article, page 17, November / December 2011 issue. See www.aiaahouston.org/newsletter for archived and searchable issues. 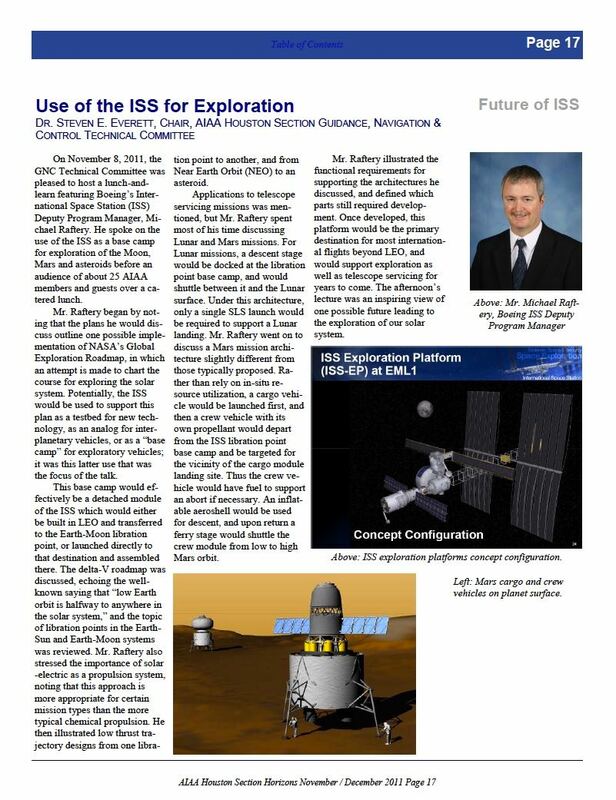 Publicity flyer for the 2011 lunch & learn by Mr. Michael Raftery, Boeing ISS Deputy Program Manager. C-2.3 Finding Solutions to NASA’s SpaceSuit Water Intrusions during EVA by Keisha Antoine, PhD, PE and Yvonne Vigue-Rodi. Engineers as Educators (co-hosted with ATS 2016), thanks to Dr. Edgar Bering of the University of Houston. Citizens’ Climate Education. Peter Bryn was kind enough to accept an invitation from Section council member Douglas Yazell to attend ATS 2016 with a CCE table. Our Annual Technical Symposium (ATS) climate change track therefore continues its ATS tradition which started with ATS 2013. 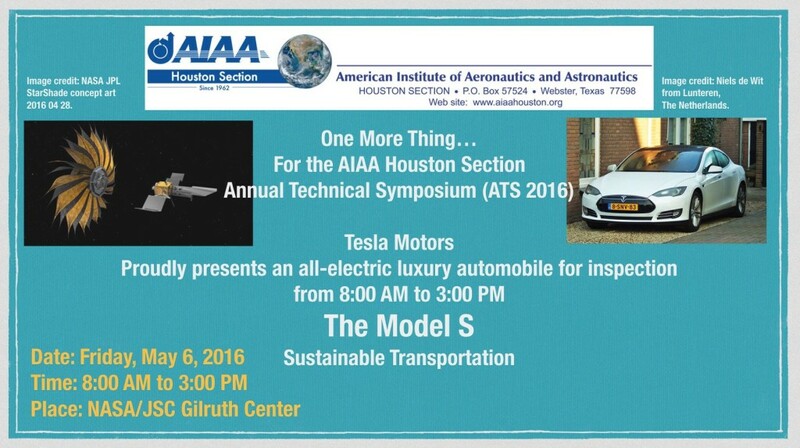 ATS 2016 climate change track presented the CCE table, a presentation by Dr. Daniel Cohan (Rice University atmospheric scientist), and a Tesla Model S available from 8:00 AM to 3:00 PM for inspection by ATS attendees, presented by Tesla Motors Inc. from the Houston Galleria, along with Tesla employees Ajju (Afzal) Hussain and Monika Benavides, along with their manager Derrick Johnson (not in attendance at ATS 2016) who made this possible. Please note that our Section’s volunteer Communications Chair Jesi Hoolihan facilitated this appearance by the Tesla Model S, since she works for Tesla in the Houston Galleria. Also our Section Chair Elect Svetlana Hanson owns (with her family) a Tesla Model S, a Chevy Volt, and a Ford C-Max. She volunteered to bring one of those to ATS 2016 once she learned about the Tesla Model S connection to ATS 2016. Dr. Cohan was a presenter for ATS 2014, too, and his charts from that event are available here. See you next year at ATS 2017!